The American College of Surgeons National Surgical Quality Improvement Program (ACS NSQIP) surgical risk calculator (SRC) aims to help predict patient-specific risk for morbidity and mortality. The performance of the SRC among an elderly population undergoing curative-intent hepatectomy for hepatocellular carcinoma (HCC) remains unknown. Patients > 70 years of age who underwent hepatectomy for HCC between 1998 and 2017 were identified using a multi-institutional international database. To estimate the performance of SRC, 12 observed postoperative outcomes were compared with median SRC-predicted risk, and C-statistics and Brier scores were calculated. Among 500 patients, median age was 75 years (IQR 72–78). 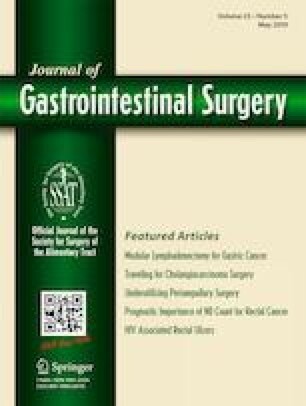 Most patients (n = 324, 64.8%) underwent a minor hepatectomy, while 35.2% underwent a major hepatectomy. The observed incidence of venous thromboembolism (VTE) (3.2%) and renal failure (RF) (4.4%) exceeded the median predicted risk (VTE, 1.8%; IQR 1.5–3.1 and RF, 1.0%; IQR 0.5–2.0). In contrast, the observed incidence of 30-day readmission (7.0%) and non-home discharge (2.5%) was lower than median-predicted risk (30-day readmission, 9.4%; IQR 7.4–12.8 and non-home discharge, 5.7%; IQR 3.3–11.7). Only 57.8% and 71.2% of patients who experienced readmission (C-statistic, 0.578; 95%CI 0.468–0.688) or mortality (C-statistic, 0.712; 95%CI 0.508–0.917) were correctly identified by the model. Among elderly patients undergoing hepatectomy for HCC, the SRC underestimated the risk of complications such as VTE and RF, while being no better than chance in estimating the risk of readmission. The ACS SRC has limited clinical applicability in estimating perioperative risk among elderly patients being considered for hepatic resection of HCC. The study was approved by the Institutional Review Boards of all participating institutions. Centers for Medicare and Medicaid Services. The Administration, Cost, and Impact of the Quality Improvement Organization Program for Medicare Beneficiaries for Fiscal Year 20172018. Available from: https://www.cms.gov/Medicare/Quality-Initiatives-Patient-Assessment-Instruments/QualityImprovementOrgs/Downloads/Annual-Report-to-Congress-QIO-Program-Fiscal-Year-2017.pdf. Accessed 4 Jan 2019.